I’m taking my favorite French macaron recipe and turning it into a giant macaron cake!! 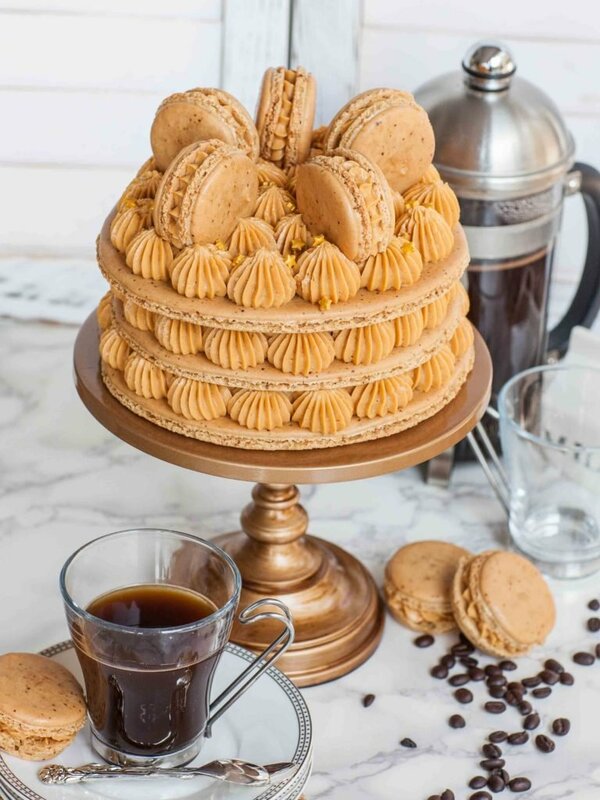 This caramel coffee macaron cake is not only beautiful but also amazingly delicious! The coffee macaron discs are filled with salted caramel frosting and simple coffee custard. 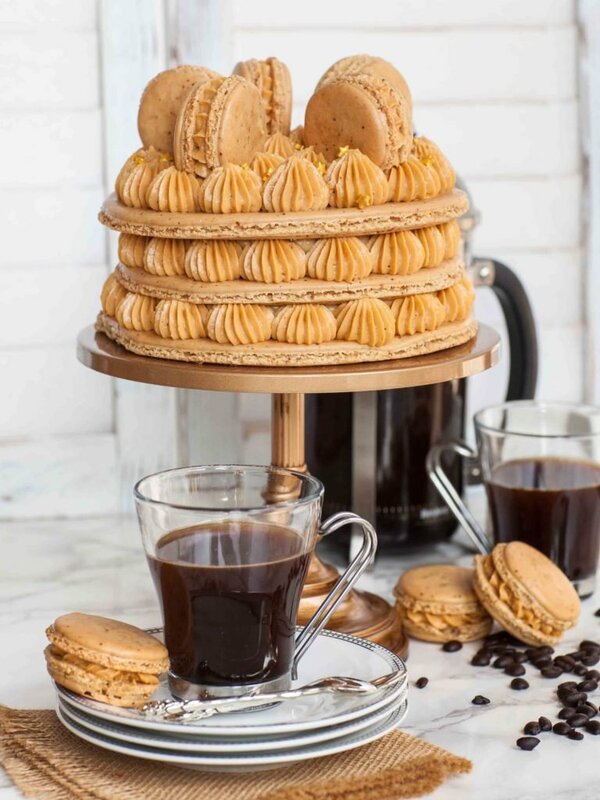 Garnish the cake with more coffee macarons and frosting! Watch my video recipe for step-by-step instructions on how to make this cake! Want to receive new recipe updates? Make sure to subscribe to my YouTube channel! While most macaron recipes are gluten-free, this recipe is not. My macaron cake version includes just a touch of all-purpose flour that plays a very important role in making this recipe work! Since the macaron discs are so large, the weight of the batter weighs them down, causing them to collapse in the middle. The addition of gluten helps keep the layers light, fluffy and prevents them from collapsing! You can use this little trick for other macaron recipes if you’re having a hard time keeping your macarons full and fluffy! All About The Coffee Flavor! My all-time favorite macaron flavor is coffee with salted caramel! I love how the bitter coffee offsets the sweetness of the French macaron recipe and the salted caramel filling just makes it even better. 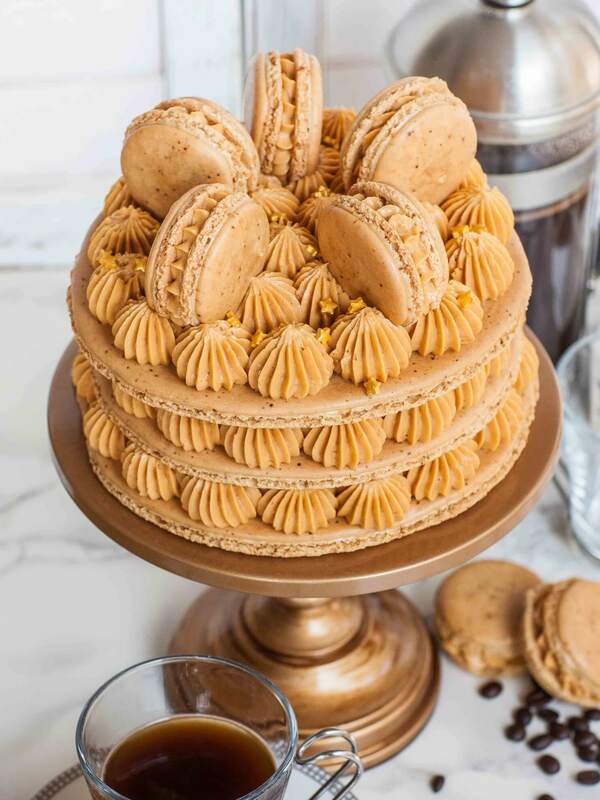 Those amazing flavors are the inspiration for this macaron cake! To get the strongest coffee flavor without adding additional moisture to the batter, I add instant coffee powder. I pulse the coffee with the almond flour and sugar to break it down. 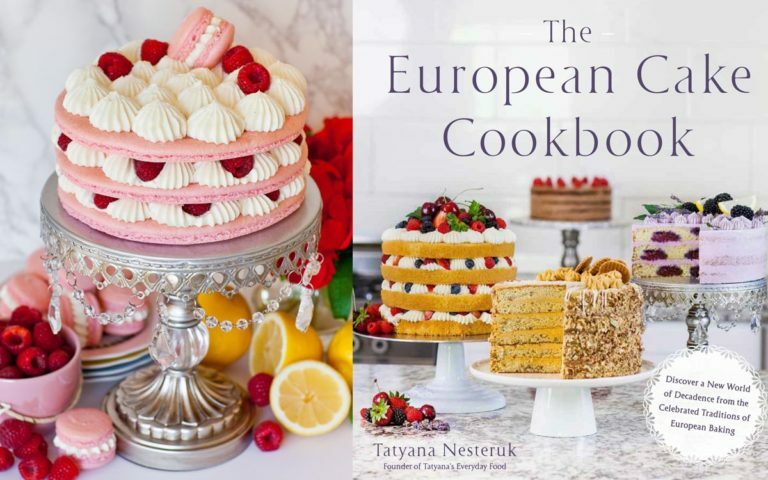 I shared this stunning ‘Raspberry Lemon Macaron Cake’ recipe in my cookbook, ‘The European Cake Cookbook’. Get your copy today if you haven’t already! I love these aluminum half sheet baking pans – great for everything! Use this set of jumbo cake decorating tips for piping the batter and the frosting. This set of disposable pastry bags means no more washing bags! Prepare the macaron layers first. Line three baking sheets with parchment paper. On the back of the paper, trace 6-inch (15 cm) circles. Prepare a large pastry bag tipped with a round tip; set aside. Place the almond flour, all-purpose flour, coffee and sugar into a food processor. Pulse for 2 to 3 minutes, until a uniform mixture forms. Then sift the dry ingredients into an extra-large mixing bowl using a fine mesh sifter. In a separate mixing bowl, whisk together the egg whites and sugar just until stiff peaks form, about 3 minutes. Add the meringue to the dry ingredients and fold thoroughly using a large spatula, pressing the batter against the bowl sides to deflate the meringue. Keep folding and mixing until the batter reaches ribbon stage: ribbons off the spatula smoothly and settles back down on itself within 10 seconds. Transfer the batter into prepare pastry bag. Starting from the center of traced circle, pipe the batter onto prepared parchment paper, forming a large, flat disk. If any batter remains, pipe 1-inch macaron disks. Tap the baking pan hard against kitchen counter to release any trapped air bubbles. Rest the macarons to set for at least 1 hour, allowing a thin shell to form on the outside. Meanwhile, preheat oven to 320F (160 C) and prepare the coffee custard and salted caramel frosting. Prepare the vanilla custard according to the instructions, replacing the vanilla extract with 1 tsp coffee extract of 1 tbsp of instant coffee. Once the custard is done, cover it with plastic wrap and refrigerate until it's cooled completely. Prepare the salted caramel frosting according to instructions. Transfer the buttercream into a large pastry bag tipped with a large star tip; I used tip #8ft. Once macarons are rested, bake one sheet at a time in the preheated for 18 to 20 minutes. Remove the macarons from the oven and allow them to cool on the parchment paper. Once cooled, gently turn the large macaron upside down and peel away the parchment paper gently. To assemble the cake, first pipe dollops of salted caramel buttercream along the edges and add a few dollops into the center; this will help hold up the cake. Fill the center with a generous amount of coffee custard, then top with the next layer. For the top, cover the enter surface with buttercream, then garnish with smaller macarons. For the regular sized macarons, fill them with the salted caramel frosting. For best results, allow the cake to chill in the refrigerator overnight; this will make it much easier to cut! Once chilled, use a sharp, serrated knife to slice the cake.